Halifax’s office vacancy rate is still high, despite creeping down from a year ago, and net rental rates have also dropped, according to the latest rental surveys by Turner Drake & Partners Ltd.
Halifax’s, Nova Centre. Photo credit: Alexandra Baird Allen, Turner Drake & Partners Ltd.
“Demand will catch up eventually or supply and demand will come back into balance in one form or another,” said Alexandra Baird Allen, senior manager of economic intelligence for the Halifax-based firm that provides landlords and tenants with property tax, valuation, counselling, planning, economic intelligence, space measurement and commercial brokerage advice. A balanced market has a vacancy rate of five to six per cent. Halifax’s vacancy rate is 15.25 per cent overall, down from 16.97 per cent a year ago, when all of the city’s eight sub-markets are combined. The vacancy rate in the central business district fell to 18.35 from 19.53 per cent, while the rate in the suburban market is down to 7.97 from 9.76 per cent. The majority of new office construction was concentrated in suburban business parks a decade ago, driven by the lower costs of land and construction and the ease with which planning permission could be obtained. This head start on capturing tenants looking for modern space resulted in the lower vacancy rates. “We didn’t have any new downtown supply for decades,” said Baird Allen, who noted that, until the last few years, the last office buildings to come on stream was the Purdy’s Wharf complex in 1990. A construction boom has made a lot of new downtown supply available in short order, which has created more supply than demand. While new buildings are filling up, other space is being cannibalized as there’s plenty of lateral movement or moving up in class. 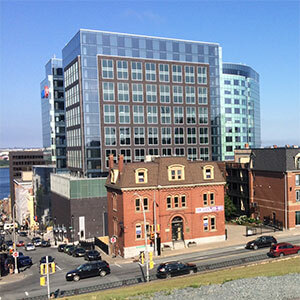 Armour Group’s nine-storey, 85,500-square-foot RBC Waterside Centre was one of the early new buildings to come on stream in 2014, and it took tenants from the 13-storey Royal Centre. RBC took four floors of the LEED Gold-certified RBC Waterside Centre, which is fully occupied. BMO moved people from the 18-storey BMO Building to Argyle Developments’ 270,000-square-foot Nova Centre, which opened late last year. TD Centre’s floor area approximately doubled in size to about 200,000 square feet following a 2014 renovation. Baird Allen said the former building was about 40 per cent vacant at the time of the survey while the latter is close to half vacant. Law firm Stewart McKelvey will take over three-quarters of the commercial space in Armour Group’s 450,000-square-foot Queen’s Marque mixed-use project that’s fully pre-leased and scheduled to be completed at the end of 2020. Companies moving to newer or better spaces can often afford higher rents because they’re likely taking less space. For instance, Halifax’s Deloitte office will reduce its office footprint by 20 per cent when it moves into 20,000 square feet in Queen’s Marque. “There has been a sea change in terms of how people are using office space and a movement to a more open concept office plan that typically uses fewer square feet,” said Baird Allen. The preferred incentives that landlords are offering to fill empty space are free rental periods and contributions to leaseholds, which can range from $5 to $25 per square foot, according to Baird Allen. “Oftentimes landlords will prefer free rental periods because there’s no cash outlay for them at the front so, effectively in terms of the rent they’re getting, it’s the same as if it was vacant, but the tenants are covering the operating expenses. Halifax’s overall net rental rate dropped from $14.15 to $13.97 per square foot. Only class-A bucked the trend, with new space pushing the rate up from $17.16 to $17.27 per square foot. The class-B rate dropped from $13.08 to $12.89 per square foot and class-C fell from $11.23 to $10.76 per square foot. Baird Allen said there are rumblings in the market some property owners are looking at alternative uses and redeveloping struggling office buildings, but none have pulled the trigger.